This country, with its institutions, belongs to the people who inhabit it. Whenever they shall grow weary of the existing government, they can exercise their constitutional right of amending it, or exercise their revolutionary right to overthrow it. Abraham Lincoln. America is not the US administration who practiced all kinds of human rights violations, spying on the entire world, and using barefaced double standards policy in the Middle East region. America is not Sheikh Barrack Hussein Obama who talks About honor, principles and democracy while practicing political immorality against humanity, called Al Qaeda in Syria”freedom fighters” and conspired against Egypt’s national security with his Muslim Brothers. America is not Susan Rice who is fond of African dictators, and claimed that she stands for human rights, while she supported war criminals committed genocides against their own people. America is not Hilary Clinton who threatened Egyptians of the serious and bad consequences if any other presidential candidates win the elections than Mohamed Morsi. America is not George Bush the idiot who didn’t know the difference between Austria and Australia, invaded our countries to refresh the US economy and killed millions of Iraqis citizens under the claim of WMD that were not found even on planet Mars! 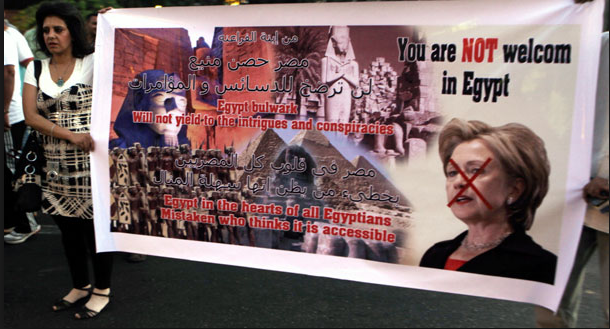 America is not the NGOS who funded and trained Egyptian political activists on destabilizing the country, applied a fake paid democracy by force and spied on their own country in favor of foreign agendas. America is not the US working group against Egypt or the freedom house or the Carnegie endowment for international peace led by the disgusting Michele Dunne who addressed a letter to Obama, inciting his administration to punish Egypt and force sanctions against Egypt and practice influence to release Muslim brotherhood terrorists and political activists who are facing serious charges of espionage, treason, terror acts and corruption. America is certainly not this working group against Egypt, who claimed that Egypt must be punished for fighting terrorism, because this terror is a threat to America. I’m telling this working group against my country, that you guys are the real enemies and serious threat to your own people. America is not the International human rights organizations who are biased to Muslim Brothers terrorists and totally blind and deaf in ignoring all this terrorist organization’s crimes against the Egyptian society since they reached power till this minute we speak. America is not the International news agencies who rent their pages, reporters and journalists to the Muslim Brotherhood International organization, in order to pay their bills and salaries and misleading their public opinion in publishing lies and false news that only serve terrorists groups in Egypt. America is not the US officials who are challenging more than 33 million Egyptian’s will in running their own internal affairs the way it suits them, and reject any foreign country’s interference in their affairs. America is definitely not those US officials who attack Egypt even when we are burying our martyrs. America is not the government’s policy towards Egypt, which is spreading hatred and anger in Egyptians hearts towards the United States of America. America is not those who were involved in dirty deals with Muslim Brothers regime, launching a fierce campaign attack against Egypt, and deliberately ruining Egypt’s reputation because they are panicking like rats, from what the Muslim Brothers and Mursi’s trials will reveal and expose them in front of their public opinion. America is not Obama’s administration who refused to consider Muslim Brothers terrorist group despite all their crimes and direct link to terrorism. America is the old veterans and brave soldiers who fight for the right cause, and realize that the worst thing a soldier can face, is not the bullet in the heart by the enemy, but it is the bullet shot at his back from inside the border. This is what our Armed Forces are receiving. America is the good American people who believe in live freedom and peace, and let others live. America is the people who believe in principles and their principles are loyal to their patriotism. America is the American dream of humanity liberation, independence and treating others the way they want to be treated, with respect. America is all those Americans who realize that fighting terrorism is not going to succeed by exporting it to our region, but it will succeed if American people stand against their government’s participation in terror, and to always remember that Egypt is fighting the same terrorism that killed their beloved on 9/11. America is the people who Don’t participate in massacring our society, but they are strongly supporting our cause to win this battle against this pure evil dark terrorism. They remember us in their prayers and they realize that we are fighting for the same cause and we are fighting the same enemy. America is the people who refuse to remain silent about their president haughty Eyes, lying tongue, hands that shed innocent Blood, heart that devises wicked plans, feet that make haste to run evil, false witness who breathes out lies and sows discord among brothers. There are two Americas now. Egypt is no longer an ally to the America’s George Bush or Obama. Egypt is no longer an ally to the arrogant double standards US in the use of great power to dominate the entire world, and using of force and all kinds of pressures to force Egypt to kneel and obey the master of the world. We have no desire to be the world’s policeman. But America does want to be the world’s peacemaker. JIMMY CARTER, State of the Union Address, Jan. 25, 1979. Whatever America hopes to bring to pass in this world must first come to pass in the heart of America. DWIGHT D. ISENHOWER, inaugural address, Jan. 20, 1953.